The apprehension of illegal aliens crossing the U.S. southwestern border with Mexico increased for the fourth straight month. Total apprehensions doubled from an April low and increased nearly 25 percent over July — nearly reaching August 2012 levels. In August, Border Patrol agents apprehended 22,293 illegal aliens who crossed the southwestern border from Mexico. This is up from July’s total of 18,190 and represents an increase of 22.56 percent, according to information obtained from U.S. Customs and Border Protection (CBP) officials by Breitbart Texas. The total apprehension of these illegal aliens is up dramatically from a low-point in April when the number of arrests fell to 11,125. Since that time, the number of arrests increased by just over 100 percent. 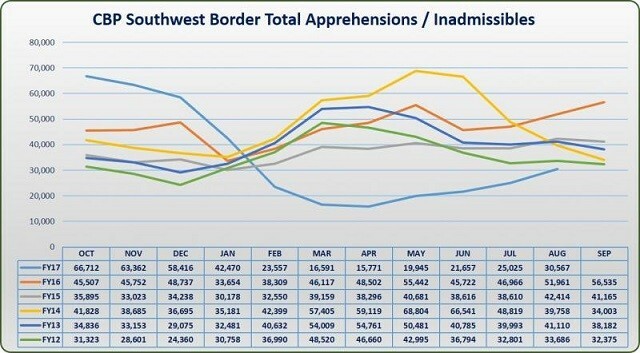 In most of the years reported by CBP officials in this chart, the number of apprehensions declined in August or remained nearly flat due to the summer heat. The exception to that came in 2016 in the run-up to the presidential election. The arrests of Unaccompanied Alien Children (UAC) and Family Unit Aliens (FMUA) also increased for the fourth time since April’s low-point. In August, Border Patrol agents apprehended 2,994 UACs, up from 2,481 in July (an increase of 20 percent). During that same period, agents arrested 4,645 FMUAs, up from 3,389 in July (an increase of 37 percent). The Rio Grande Valley Sector in South Texas continues to lead the nine sectors that make up the southwest U.S./Mexico border. 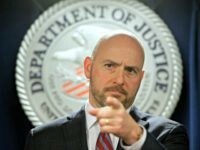 Agents arrested a total of 8,650 illegal immigrants in this single sector, up from 7,107 in July (a 21.7 percent increase). UAC arrests totaled 1,296 in August (up from 1,194 in July). FMUA arrests increased from 2,098 in July to 2,815 in August (an increase of 34.18 percent increase). CBP officials did not offer any explanation for the dramatic increases in apprehensions in a month where a decline in apprehensions is the norm. Apprehensions dropped to historically low levels in the months after President Donald Trump took office in January. In August, four months of increased returned the apprehension levels to about the same point as the 2012 presidential election year where voters re-elcted President Barack Obama. Following then-President Obama’s implementation of the Deferred Action for Childhood Arrivals program in June 2012, the number of apprehensions, particularly of UACs and FMUAs, began to steadily increase in every year except 2014. Those numbers peaked in November of 2016 when a total of 63,362 illegal aliens were either arrested after crossing the border illegally or were determined to be inadmissible by CBP officials.